We paid a visit to the allotment on Christmas Eve to gather together some fresh vegetables to see us through the Christmas period. 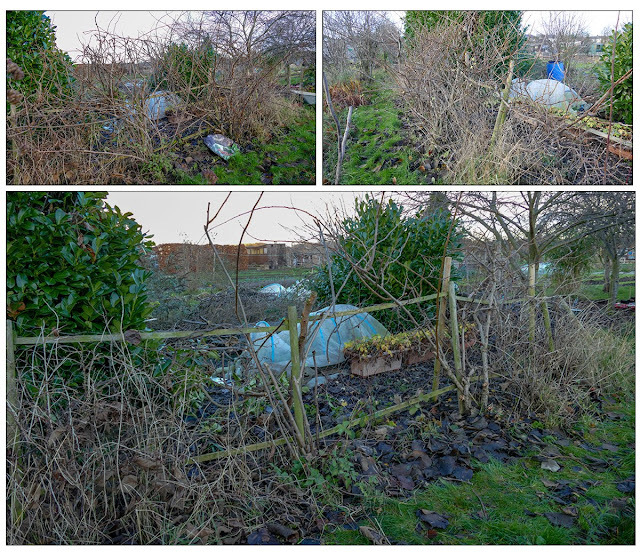 The allotment certainly looked Christmasy as two thirds of the plot were still covered in frost. The problem is that the property adjacent to our site has a huge leylandii hedge which for much of the winter shades about two thirds of our plot. You can spot it in the background of the photo above. Not only does it shade most of the plots on our site at this time of year but it also provides an ideal habitat for the wood pigeons that just love to plague us. The sun was shining on Christmas Eve but was so low that it didn't make any impression on one side of our plot and half way across the other side. It also meant that in the shade it was bitterly cold. Where the sun peeped over the hedge it blazed into our faces blinding us when walking towards it. As my eyes are sensitive to bright sunshine at the best of times this is very unpleasant. You can just make out in the photo above the line where the sun has reached and melted the frost. 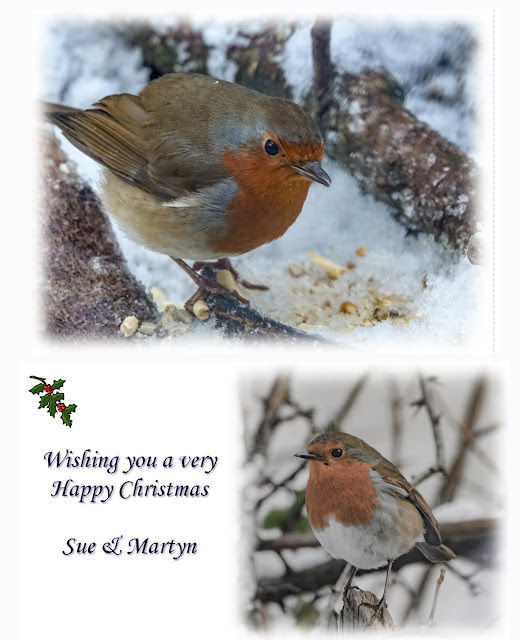 At this time of year we are envious of Jan, our neighbour, who has his plot to the left of this photo. His plot is out of the shade cast by the hedge and was working in the sunshine. As we didn't intend staying longer than we needed to harvest a few vegetables and take a few photos and video we didn't end up too cold but it was good to arrive back home and into the warmth. So what did we manage to harvest? We replenished our stock of carrots and parsnips. We had harvested all of the Below Zero leeks and so moved on to the second variety - Oarsman. These leeks had grown much bigger than the ones harvested from the previous variety and were more the size we would expect. Rather earlier than intended - these cabbages were meant to be harvested early next spring - we cut our first Savoy cabbage. The variety is Sabrosa. It wasn't very large but the head was solid and provided us with a couple of meals. As I mentioned in my previous post, this year our sprouts have been a big disappointment. We really didn't expect to harvest any at all but we did manage to pick enough tiny sprouts to have with Christmas dinner. Maybe we will manage to harvest a few more, but really they only provide a taster. It's better than nothing though. Finally, I'd like to wish everyone a happy, healthy and fruitful new year. It's been quiet plot-wise for a couple of weeks. Combined with this and a few other issues my blog has been rather neglected so I thought I had better get posting again. A week or so ago one of the subscribers to Martyn's YouTube channel nominated him to film a review about how things have gone on our plot over 2018. Of course I was roped in as a sidekick and then I was also nominated by one of my subscribers so in a way it was a case of one video fulfilling two nominations. To be honest I don't like being in front of a camera these days, especially not to be filmed. I'm still having eye problems which cause me to blink a lot which looks ridiculous and also I'm not able to wear contact lenses at the moment and am very self conscious wearing my thick lensed glasses. Anyway all that aside we managed to produce something which we have posted on our Vlog here. To spare you watching the video I thought I'd write a summary of our review here. What was your best crop of 2018? In answer to this, Martyn chose the spring and summer brassicas. 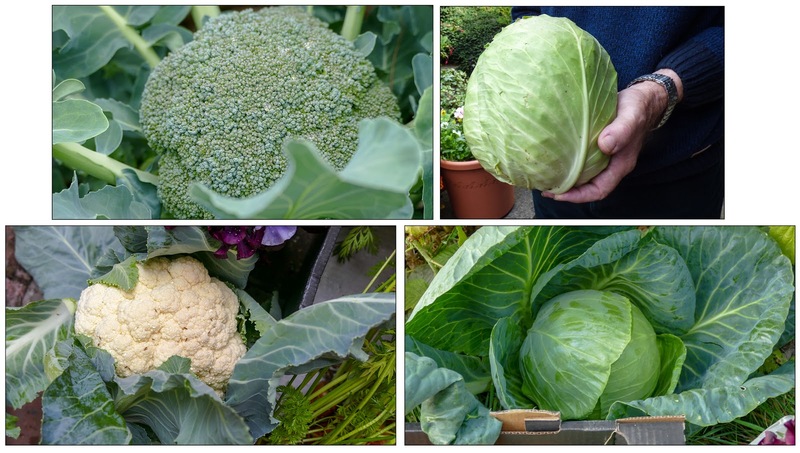 We had a good crop of cabbage, calabrese and cauliflowers. We grew our brassicas under enviromesh which did a good job of keeping any pests off which on our site with so many 'creatures' on the look out for whatever they can devastate is no mean feat. I chose carrots and parsnips. 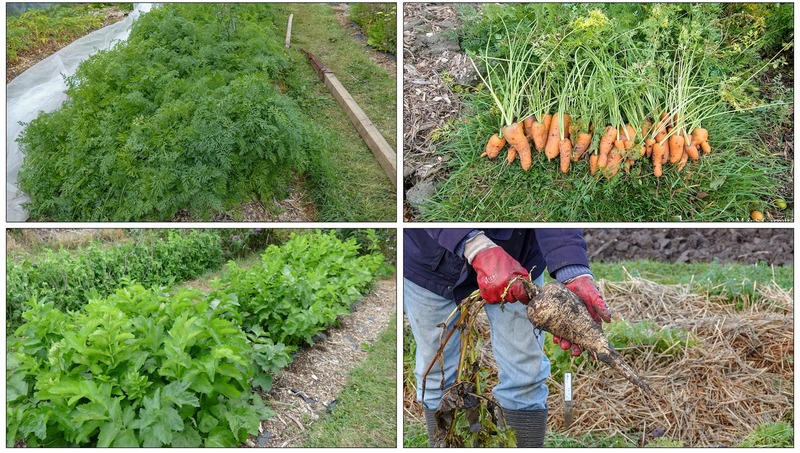 Last year we sowed carrots three times and, although each time the seeds germinated, nearly every seedling was munched by slugs or snails. Any roots that did survive were spoiled, probably by the same culprits. This year we have had a really good harvest. As for the parsnips, we had what looked like a 100% germination rate which meant that I had to bite the bullet and thin out the seedlings. The roots vary in size but we pulled our largest parsnip ever this year. 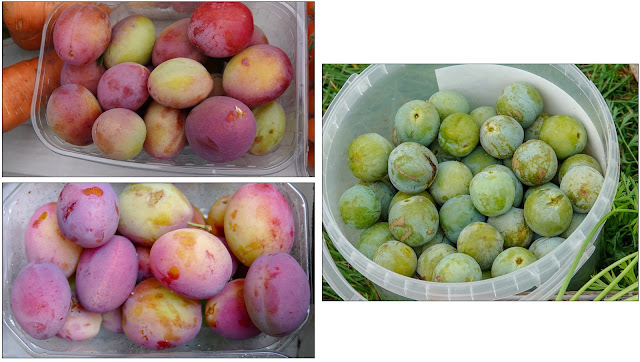 Martyn chose plums and greengages as the best performing fruits. Most years the plums do fairly well. They tend to have a bumper year followed by a leaner year. This year was a bumper crop and my waspinators seemed to keep the wasps away. This year's greengage harvest was the best ever. In fact this year's crop was almost as great as the total of all the previous year's harvests. This was a treat as we love greengages which are surprisingly sweet given that the green fruits don't even look ripe. For my star fruit, I chose cranberries. Lots of different berries would have been worthy contenders. The cranberry didn't produce the largest crop but one of the bushes had more fruit than it has ever had before. 2. What was your worst crop of 2018? Martyn chose potatoes in answer to this question. The potatoes just didn't like the weather conditions in 2018. The plants never flourished. Normally we have potatoes in store to use most of the autumn, winter and early spring but this year we have nearly run out and the tubers that we did manage to harvest were either small or spoiled. I chose sprouts as the worst performing vegetable. Our sprouts usually do well but this year the plants just stopped growing. Despite growing under enviromesh the plants seem to have fallen victim to aphid attack. Now when we should be picking them they have only produced tiny buds. We did manage to pick one or two diminutive specimens for Christmas dinner though. Martyn's disappointing fruits were strawberries. Most of our strawberry plants dried up and withered. We're guessing that we will need to replace them next year. I chose two fruits in answer to this questions. The first were the gooseberries that for the first time ever fell victim to mildew. For my second selection I chose pears. The pears were loaded with blossom, the bees busily pollinated the flowers but hardly any fruit set. Even though we try not to fall into the trap of planting, or sowing, too early it is always difficult to ignore the fact that everyone else seems to be pressing on with things when we are still not even off the starting blocks. With the cold start to spring this year we fell into the trap of being impatient for conditions to improve and started one or two things a bit too early. We know that things sown or planted later do catch up but it's always so tempting to make a start as early as we can. 4. What was your biggest challenge this year? Without doubt this was the weather, and not just the hot dry summer when we were watering nearly every day. We had a cold, snowy start to spring. Early on the ground was too wet and soggy to dig and then, when the weather warmed up, quickly this turned into ground too dry and hard to dig. On top of all that we had gales that, amongst other things, flattened our newly planted leeks. Martyn is on the lookout for a potato called Athlete that was recommended by one of the YouTube channels that he subscribes to. He also wants to grow some Sarpo potatoes in some of our rougher beds. As these will be planted later than our other potatoes he wants to use blight resistant varieties. I want to grow some fleshier varieties of tomatoes which will be better for cooking and making tomato sauces for freezing. The varieties this year were juicy and produced 'watery' sauces. One variety on our list is the large ox-heart variety, Albenga, that we saw, and tasted, growing in Roger Brooks greenhouse when we visited him in September. I also want to stick to growing the round bulbed onions rather than the flatter ones. Once the flatter onions are prepared for cooking, there's not really much onion left. We also are thinking of growing more varieties of squash, probably the smaller varieties. We use a lot of squash over winter and so these would need to be suitable for storing. Neither of us were in any doubt about the answer to this. Our inspiration comes from other Bloggers, Facebookers and YouTubers. 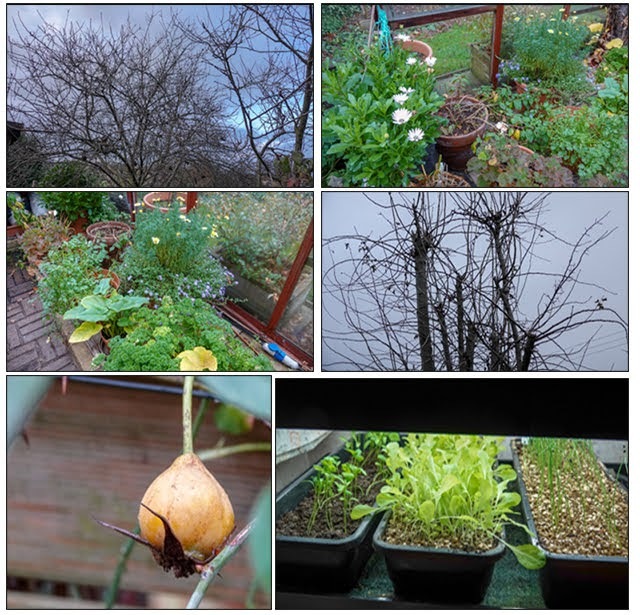 Reading what other 'ordinary' gardeners grow in their own gardening spaces is far more inspirational than anything read in magazines and books or watched on the television. So thanks you for sharing your ideas, successes and failures with us. We look forward to seeing what you are all up to in 2019. 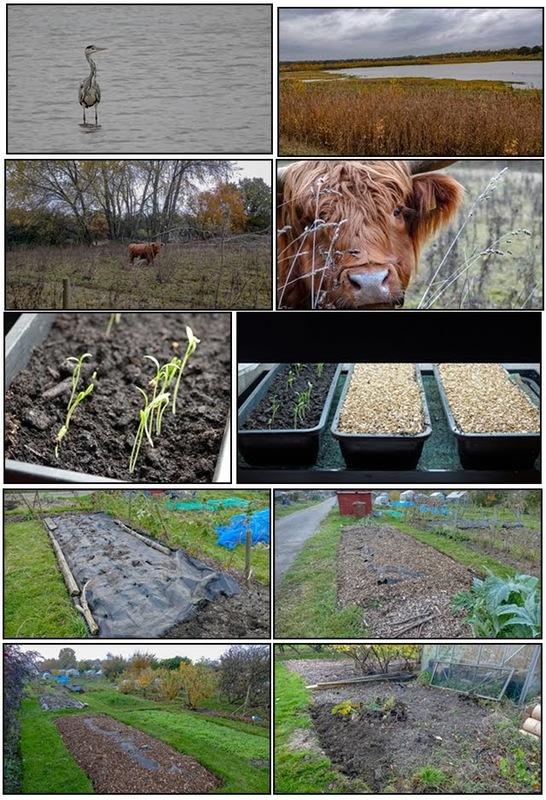 We managed a couple of visits to the allotment last week. Most of the week was wet and miserable so we were more or less confined to indoors. We escaped to attend a couple of appointments, film a steam engine and visit a couple of garden centres - although to call them garden centres at the moment is a misnomer as they have transformed themselves into festive emporiums. All things gardening have either been removed or squeezed into the background. Martyn needed some new wellies but didn't fancy what amounted to fashion statements although I thought he would look quite fetching in the pink spotty pair. We didn't waste our time completely as we had lunch at one that has a particularly good restaurant. No more garden centre visits for us now until January. The plot is rather soggy at the moment which was why Martyn needed new wellies. His old pair were fine weather wellies which in current conditions meant wet socks. This bloom of toadstools or are they mushrooms, is thriving in the damp? (When does a mushroom become a toadstool?) They are growing on the wood chippings that are mulching the bed of hardy annuals. The annuals are growing really well but will they survive winter? Mark over at Mark's Veg Plot is a fungi guru - he seems like a fun guy too, sorry I know it's hardly original but I couldn't resist - and he tells me that these are possibly Tubaria furfuracea - Scurfy Twiglet. It's not a very attractive name is it? Apparently they are inedible but not actually poisonous which must be a trait shared by the half eaten apple that is also in the photo. I don't know where it came from but I guess that it wasn't very nice and someone passing by just tossed it away. I'm sure some creature will find it and enjoy it. Mark will be able to name this other fungus too as I'm sure it will be a really common variety. This one is growing on a larger piece of dead wood. 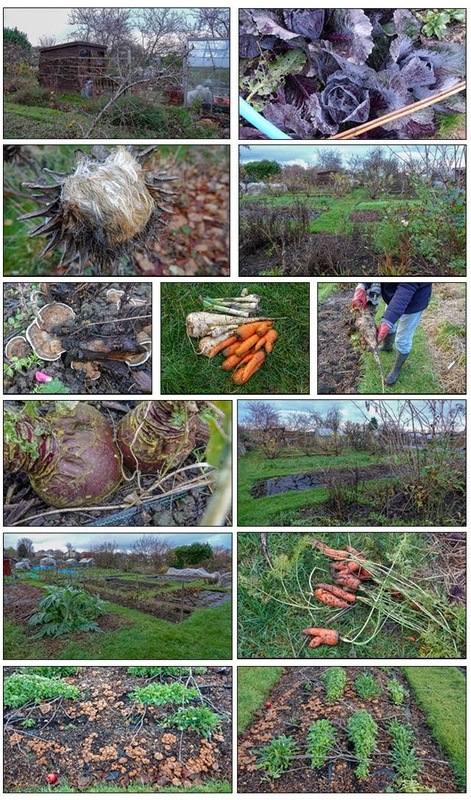 Our first allotment visit, on Tuesday, was mainly to replenish our vegetable store back at home. 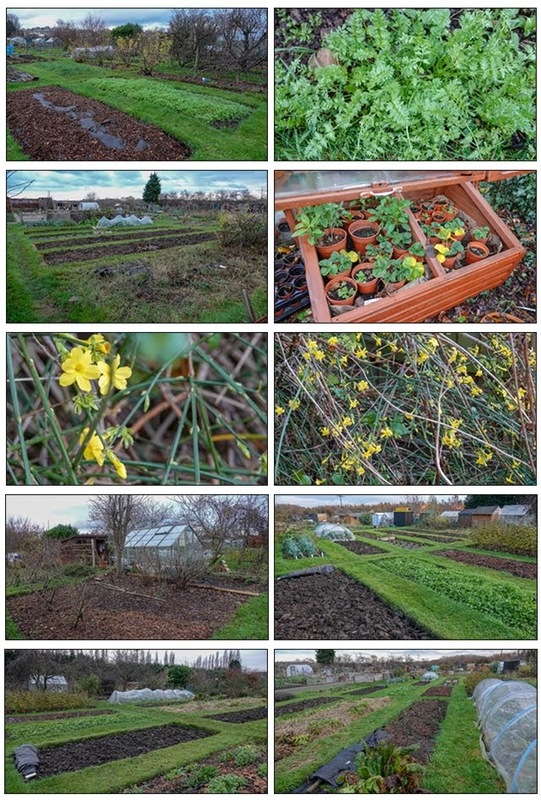 We also wanted to try out some new sound recording equipment and so decided to film a December Tour of the allotment which I have posted below - just in case you are interested. We didn't get to the allotment again until Sunday when as well as a bit more harvesting we managed to carry out a couple of jobs. The posts supporting the wires that the raspberry canes are tied into were in desperate need of replacement so Martyn spent his time erecting and rewiring new posts. I'm not sure how well the raspberries will perform next year as they don't seem to have put on as much new growth as normal so it may be that we will need to replace the canes. Whilst, Martyn was busy on this job, I tackled the two kiwis that had - to be honest - become a tangled mess and also totally hid two gooseberries plants. As we are more likely to have fruit from the gooseberries than the kiwis this needed remedying. I didn't complete this task but cut out three barrow loads of kiwi vine. The fence that the kiwi was growing along was really only being held up by the tangle of vines so it will also need some renovation as will the two gooseberries. Before we came home we gathered some more vegetables. There is a theme to our harvests at the moment - leeks, parsnips and carrots. The parsnips were not up to last week's daddy parsnip standard, I think that is going to be a one off, but there was still plenty of flesh on the roots. One parsnip went into Sunday's Turkey and Parsnip Curry. We are now digging Autumn King carrots which are huge. They are so big that they make the parsnips look smaller than they actually were. A recipe I was cooking last week called for two large carrots but I think the author's idea of a large carrot was very different to ours. I do wish recipes wouldn't use terms like small, large and medium when we have a perfectly good method of measuring by weight. The same recipe called for a thumb-sized piece of ginger but was that my small thumb or Martyn's large one? Our leeks on the other hand are still rather small. Some will be used to make a batch of Wensleydale Patties for the freezer. These use a similar recipe to Glamorgan Sausages but use Wensleydale cheese and are patty shaped rather than sausage shaped. I'm sure Wallace and Gromit would like them! We only visited the plot once last week and that was mainly a harvesting visit and to try out Martyn's new toy - the resulting video was posted in my previous post. I did take a few photographs. I usually take my Panasonic Lumix DMC-FZ1000 with me when we go to the allotment but, as this wasn't really a working visit, I took my 'best' camera which is a Sony Rx10v4. It's amazing how much better the photos are, even though I was very satisfied with the Panasonic and not really convinced that I needed a better camera when Martyn suggested it. I'm not sure the better quality will be apparent at the size I post on my blog - you can view a larger image if you click on the photos - but I'll include some if only to show how empty the plot looks. The cardoons are already putting on next season's growth but, in this part of the plot, the only crops growing are the red cabbage under the mesh in the far distance. 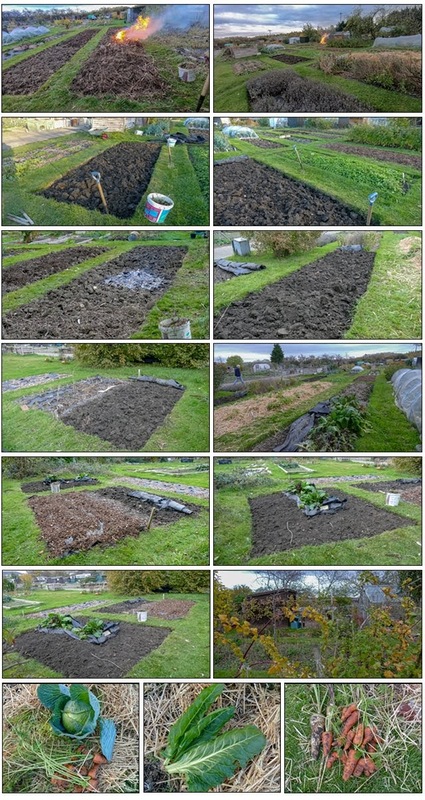 In the above part of the plot the only real growth are the two beds that were sown with green manure. 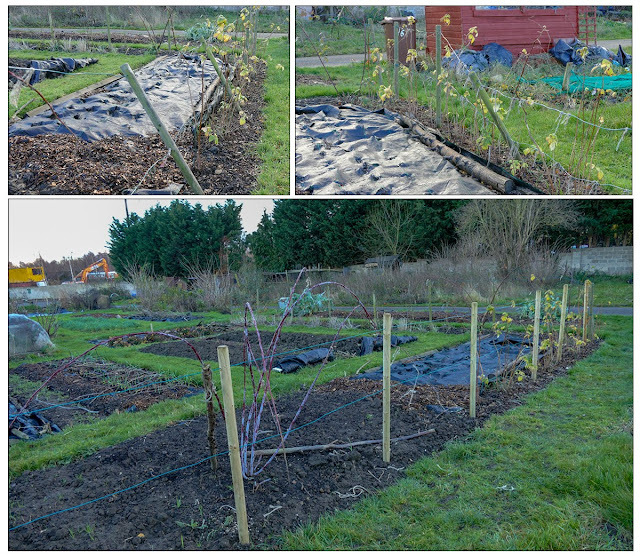 The fruit bushes and trees are now leafless. In the area above there is another bed of green manure and in the foreground is our bed of hardy annuals. In the distance the mesh is covering some very disappointing Brussels sprouts and some Purple Sprouting Broccoli plants. Under the straw are our carrots and parsnips. Above we have a bed of leeks and under the mesh we have more PSB, some cauliflowers and savoy cabbages which we hope to harvest next spring. Now on to last week's small harvest which, as is usual for this time of year, was just the vegetables that we needed for this week. We grew three varieties of carrots, Early Market, Flakee and Autumn King. Last week we harvested the last of our Early Market. We only grow one variety of parsnip, which is Gladiator, and one of the roots harvested last week lived up to its name. It was huge. As far as I can remember, it's the biggest parsnip that we have ever grown and has supplied more than one meal. Even though it was so large it was as tasty as its smaller bedfellows. As you can see below we harvested a more 'normal' sized root and a small one. They were dubbed, daddy, mummy and little baby parsnip. I wonder why three seedlings, growing alongside one another at a equal distance apart and treated in exactly the same way, produce such different sized roots. As you can see above we also harvested a few leeks which were used in a chicken, leek and mushroom pilaf. The leeks are a variety called below Zero and have only produced small 'stems'. To be honest, we didn't expect them to produce a crop at all, as straight after they were planted - which was later than we would have liked - the grass like plantlets were flattened by strong winds. We consider any harvest to be a bonus! We have two more varieties - Oarsman and Blue Solaise - to harvest after this one is finished, so it will be interesting to compare.